Since birth Nasty goes to rehabilitation centers: in Belarus, in Russia, in Germany. Now the girl is in the second grade. She really likes going to school and always misses classes on holidays. “Time spins away, and I haven’t noticed how soon the wheelchair became too small und totally uncomfortable for my daughter. 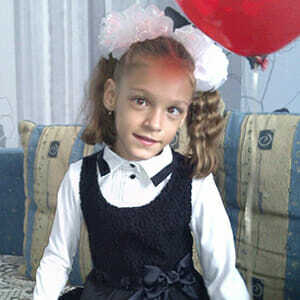 Nastya sits for 7 hours in a wheelchair at school and it’s really painful for my girl”. Children dream of different things: toys or phones. Nastya has only one dream – to sit in a comfortable wheelchair, she wants to be able to go to school with her elder brother.